Micromax Bharat 5 plus official Flash ROM is provided in this article. if your Bharat 5 Plus smartphone got bricked, having boot loop or any other software issue, you can fix these by flashing stock firmware on your phone. 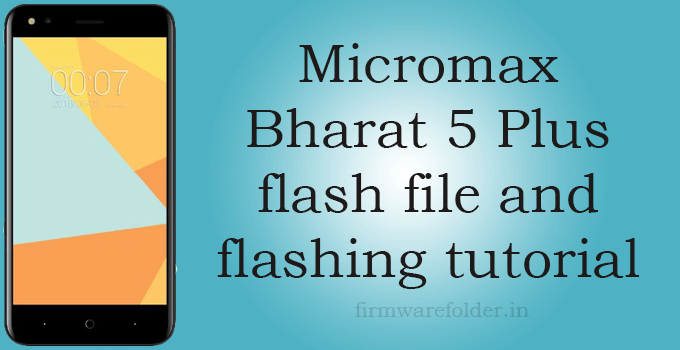 This guide provides download link to Micromax Bharat 5 plus flash file and step by step flashing tutorial with all required tool download links included. The dual-SIM Micromax Bharat 5 plus runs Android Nougat powered with 5000 mAh massive battery capacity. This phone comes with MediaTek processor with all available necessary sensors including gyro sensor. Things to do/remember before flashing Micromax Bharat 5 plus stock firmware. with usage if your phone, it may lead to some problems which can be fixed by flashing stock firmware on it. Some of the advantages of flashing stock firmware on Micromax Bharat 5 plus are listed below. Flashing stock firmware will fix issues like phone slow response, hang problem, automatic reboot. You can fix bootloop issue by flashing Micromax Bharat 5 plus flash file. You can fix problems caused by root access by flashing stock firmware. flashing Micromax Bharat 5 plus stock ROM will help you to get restore your warranty back. Please note that flashing process will erase all your data of internal storage. Take a backup before flashing your phone. you must take NVRAM backup also, follow this guide to take NVRAM backup. This tutorial requires vcom MediaTek drivers installed on your computer. follow bellow step one by one to flash stock ROM on Micromax Bharat 5 plus. Step1: At first download Micromax Bharat 5 plus flash file zip from below download section. Step2: Download and install VCom MediaTek drivers from this link. Step4: Now open the extracted and open flash tool. Step5: Now, in the opened window, click on download tab click on scatter loading file. Step6: select scatter file ( map file) from your extracted firmware folder. Step7: Click on Download button. Step8: Now, switch off your phone and connect it using the USB cable. Step9: Flash tool will detect your phone and start flashing procedure. Wait for some time to finish the flashing process. Once done, remove your phone and turn on your phone. Read – Download Micromax A111 flash file with flashing guide included. I Hope this guide helped you to restore your phone using Micromax Bharat 5 plus flash file. You can always ask for any help, problems in the comments below. Can you please upload at another site. Needrom need to have Premium Account.